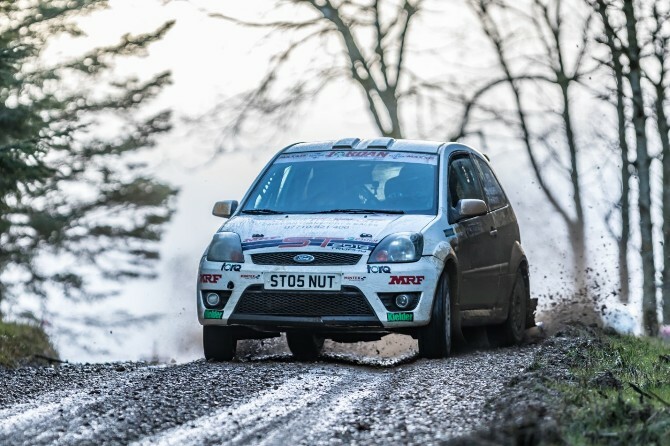 Club member Tom Wood, co driving for Welshpool driver Zak Hughes, took his 2nd win in a row in the 2019 MRF Tyres Fiesta ST Trophy at the Malcolm Wilson Rally. It wasn’t an easy win by any means, with overnight snow greeting the crews on the opening tests of Hobcarton and Coombe. The pair found themselves in 2nd going into the first of two service halts of the day closely behind rival Bobby Mitchell. The next loop of stages saw the crews head south to contest the Highman stage twice and the 12 mile Grizedale stage. The change of location saw more favourable conditions where Zak and Tom gained back some time putting them into the lead before the 2nd and final service of the day. The final stage of the day was the 2nd running of the Greystoke stage, M-Sport’s own Forestry complex. Hughes and Wood attacked to maintain a lead, only to finish the stage to find out rival Mitchell had not left service with a fuel rail issue. This meant that Hughes and Wood secured maximum points on round two and thus extending their lead in the championship. If this result want enough the crew took 2nd Silver Star (2 Wheel Drive) and an incredible 13th overall. The next event will now be the Rallynuts Stages on the 13th of April.